Pete and Cait Braun, with son, Nolan. A MEANT-TO-BE MOMENT: When they bought the first engagement ring — not a real diamond — in an antique shop, from a woman whose grandfather had given it to her grandmother when both were college students, just like Cait and Pete. They knew statistics were not on their side. Cait and Pete were 19, college kids who'd talked until sunrise the first night they met at a dormitory orientation. On their first official date, April 1 of freshman year, they lingered so long at West Chester's Iron Hill Brewery that they tucked into the leftovers the server had already wrapped up. He loved her laugh. She loved his cerulean eyes. But it was the talk — easy, lively, unending — that convinced them to defy the odds and get engaged at the start of sophomore year. Pete asked permission from Cait's father — "one of the scariest things I've ever done" — and responded to his future father-in-law's sober queries: When will the wedding be? What about your careers? What's your plan to settle down? What about finances? The couple had sorted through all those variables. They'd even talked about family — how they hoped to have a child or two biologically and then, someday, adopt. Once Pete could afford a diamond ring, he sent Cait on a scavenger hunt with clues hidden in all their West Chester haunts: the dorm where they'd met, a beach volleyball court, a crumbling farm building where they once shared take-out from McDonald's by candlelight. "I was at the end, waiting for her," Pete says. They married just after graduation, in the summer of 2010. They fostered rescue dogs. They started graduate school. They turned 22. A few years later, driving home from Pete's parents' home in the Poconos, they had "the kid conversation." Cait was ready. Pete? Not so sure. They agreed to start trying to conceive in March 2014, figuring they'd be pregnant within a few months. A few months stretched to a year. A fertility specialist prescribed Clomid. Cait had surgery to remove fibroids, then another procedure to clear her fallopian tubes. Next, a cycle of IVF. "We didn't tell people we were going through this," Cait says. "I didn't want to have to fill people in." And while Pete remained the on-task person in the pair — "I felt like I had to bring some logic…and hope" — he says, the ascent and crash of expectation each month wore on both of them. After the IVF failure, Pete handed Cait an article; in it, the author talked about the "medical treadmill" of fertility treatment and how he and his wife had decided to step off in pursuit of other ways to become parents. For Cait, "It was like a light bulb. We'd talked about adoption since we were dating. Once we made that decision, I felt this overwhelming sense of peace. I felt like I could grieve the idea of not carrying a child. Having that other goal, that other path, really helped." 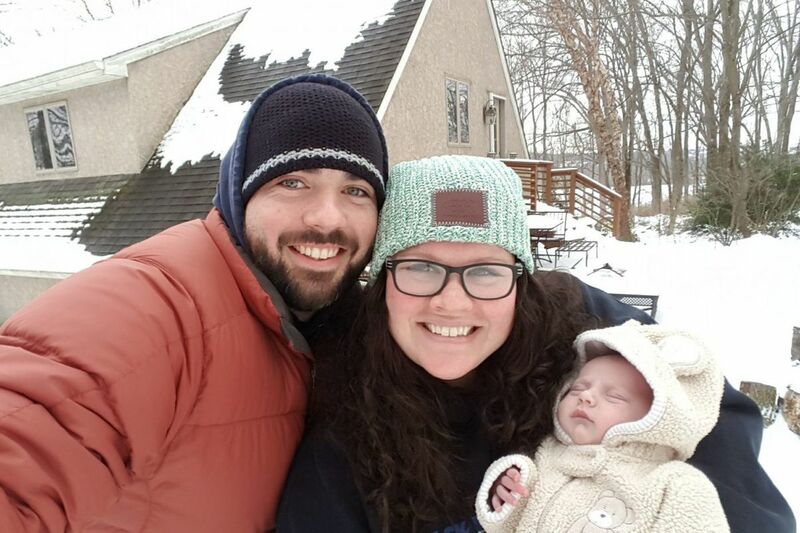 While trying to conceive, they'd been private and silent; once they began working with A Baby Step Adoption, they gleefully enlisted friends and family in the cause, setting up a GoFundMe page and even holding a fundraiser — donated food and beer, raffle baskets, a silent auction of sports tickets and vacation homes offered by friends — to help foot the cost. "We were excited. Fired up," Cait recalls. "We'd gotten this new hope." On Jan. 20, just a few months after joining A Baby Step's national network, which permits access to birth mothers' profiles and the ability to respond, their caseworker called unexpectedly. "You were picked," she told a startled Cait. "The scariest variable of this entire thing was our relationship with the birth mother," Pete says. But within the first few minutes of a three-way phone call arranged by the agency, he and Cait relaxed; this woman was candid, warm, and eager to talk with them. She was due in early March, in a town on the Pennsylvania-New York border. Cait and Pete headed up there, only to learn that the scheduled induction had been postponed. "Do you want to have dinner?" they asked the birth mom. The three met for the first time in the hospital parking lot. "She waved. We hugged. She said she knew this really good place for wings," Cait says, and they lingered at the restaurant for four hours, talking about their families, their childhoods, their lives. The birth mom loved to paint with acrylics. She was Irish, just like Cait and Pete. The next day, the trio went shopping, and the two women exchanged bracelets — "a mother-to-mother thing," Cait says, a sign that "now we have each other." Once the induction started, Cait remained in the delivery room for most of the labor — scary moments when doctors couldn't locate the baby's heartbeat; anguishing moments when it was clear the birth mom was in relentless pain. Cait had to leave the room when doctors administered an epidural. And about 40 minutes later, "they came back and said, 'Congratulations. You have a baby boy.' "
Nolan, an Irish name the birth mom chose from a short list Cait and Pete had devised, weighed 8 pounds, 8 ounces and was just over 21 inches long. Cait whispered in his minuscule ear: "Whatever you need, I will do anything for you." All that night, the three adults took turns changing and feeding and holding the baby. Pete calls the birth mom a "superhero. … She introduced us to [hospital staff] as the adoptive parents; she talked to us about every decision. It could have been an awkward, difficult situation, but she's the one who carried it and made it so much easier." In Nolan's nursery is a picture his birth mom painted: an elephant, Cait's totem animal, in a jungle. And though he is too little to understand the details, they tell him anyway: How it's not biology that makes a family, but love and persistence and courage and time. How he has one dad and two moms who love him very much. "He'll always know his birth mom and what she did for him," Cait says. "We're already telling him his story."